ghevar recipe | how to make crispy & porous ghewar at home with detailed photo and video recipe. a unique and crisp traditional rajasthani dessert recipe prepared mainly from maida and sugar syrup. basically, it is a disc-shaped sweet cake with porous texture and is mainly served by dipping it in sugar syrup or topped with milk rabdi. 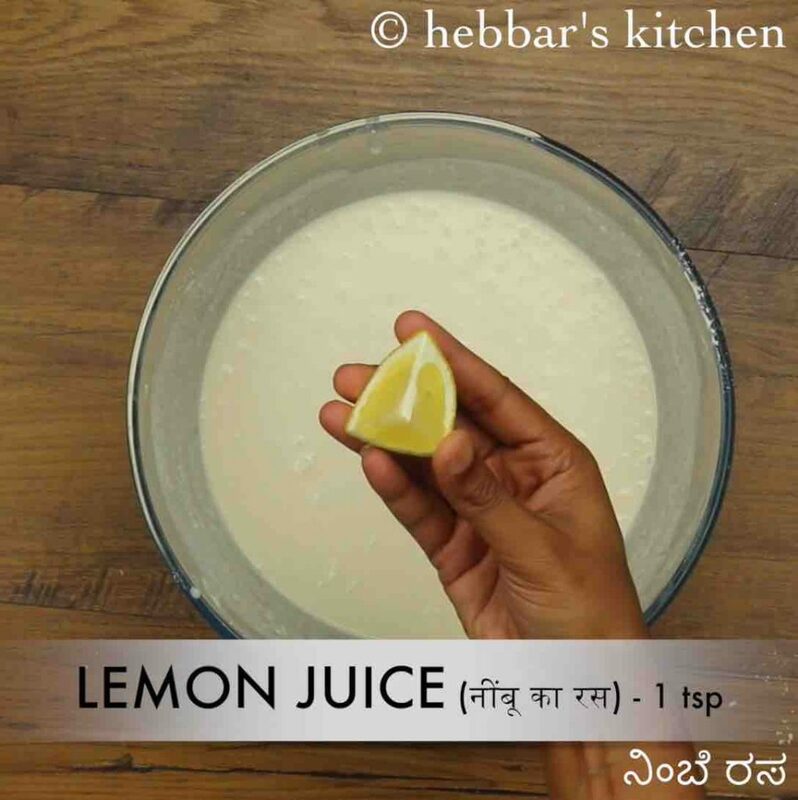 this classic indian sweet recipe is mainly prepared during a festival like teej or raksha bandhan or during the winter or rainy season of north india. 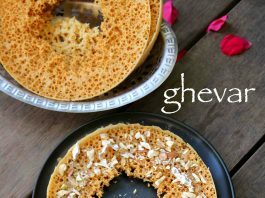 ghevar recipe | how to make crispy & porous ghewar at home with step by step photo and video recipe. a popular honeycomb dessert recipe which has its roots in the rajasthani and haryanvi cuisine. generally these days most of them prefer to buy ghevar from the local halwai or store as there is a misconception about this recipe assuming it be laborious and tough. however, it is the extremely simple recipe to prepare with few easy precautions. the local halwai or the ones prepared in the store is made using a special disc-shaped equipment on a large scale. and hence the confusion about its feasibility to make with household utensils. 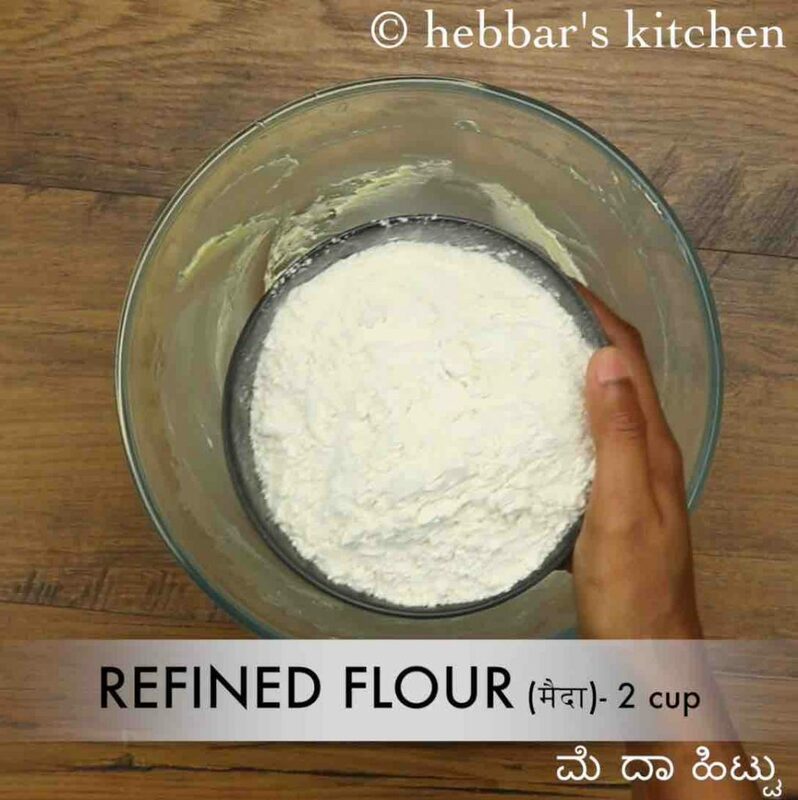 however, the same quality of ghevar can be prepared in a home with a good density and deep pan. in other words, the ghewar batter is poured into such pans at a regular interval filled with hot oil. 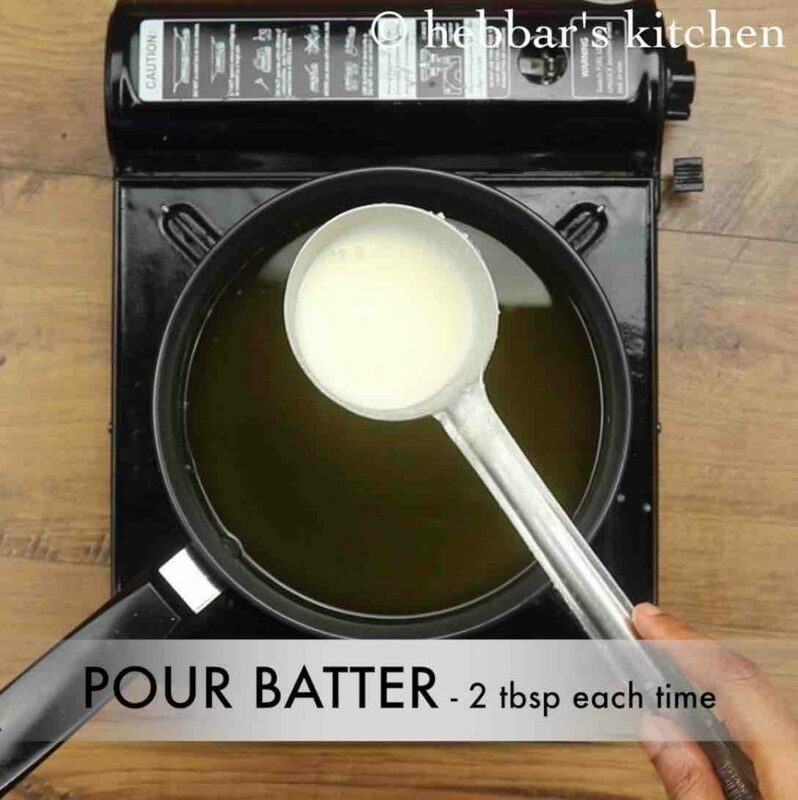 note that the quantity of batter has to be approximately of 2 tbsp and has to be poured at height of 8-10 cm. otherwise, you may miss the porous texture to ghewar and also it may stick to the bottom. 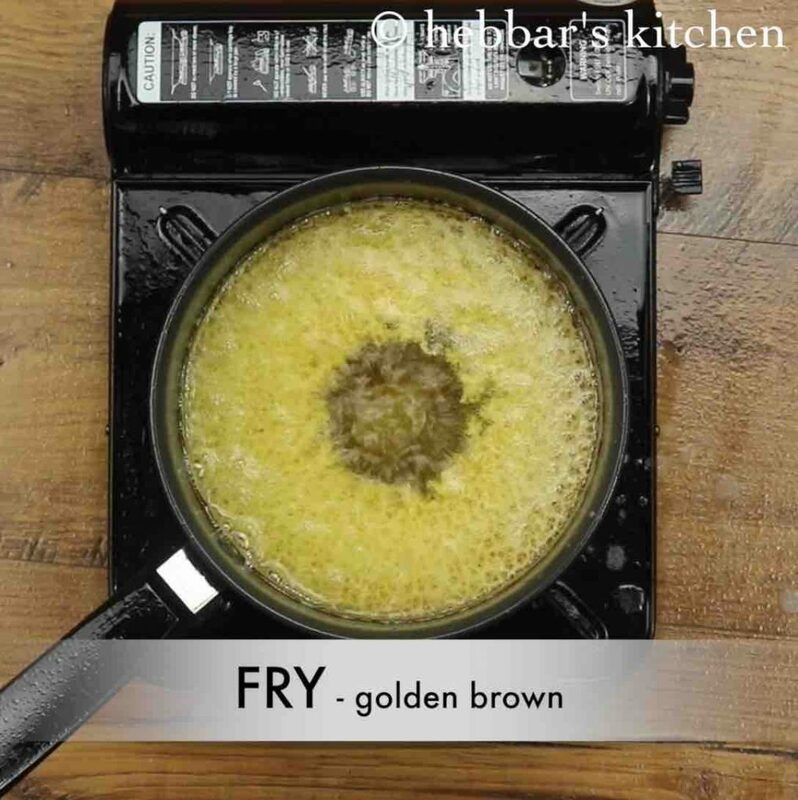 during the entire frying process make sure it has to float and not settle at the bottom. 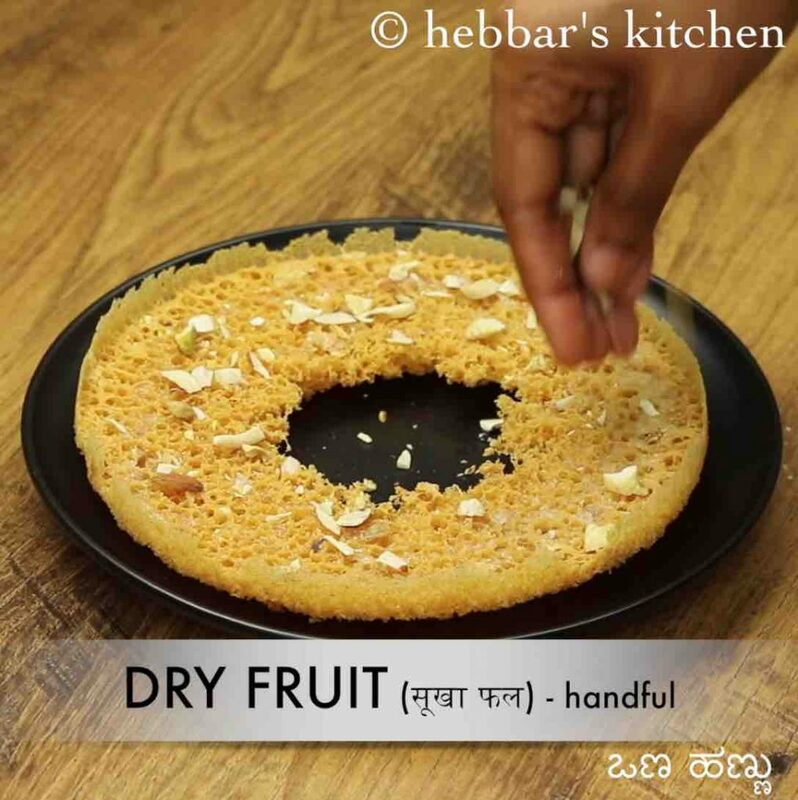 furthermore some tips, recommendations and serving ideas for ghevar recipe. firstly, i would heavily recommend sieving the maida or plain flour before proceeding with the batter preparation. 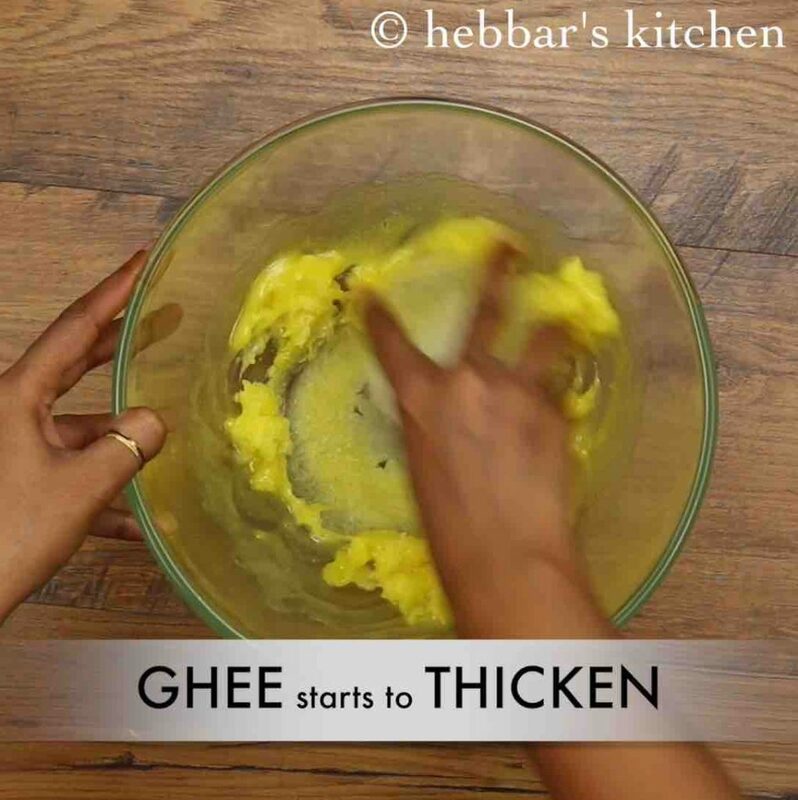 secondly, make sure to rub the ghee with ice till it reaches a thick cream like consistency. 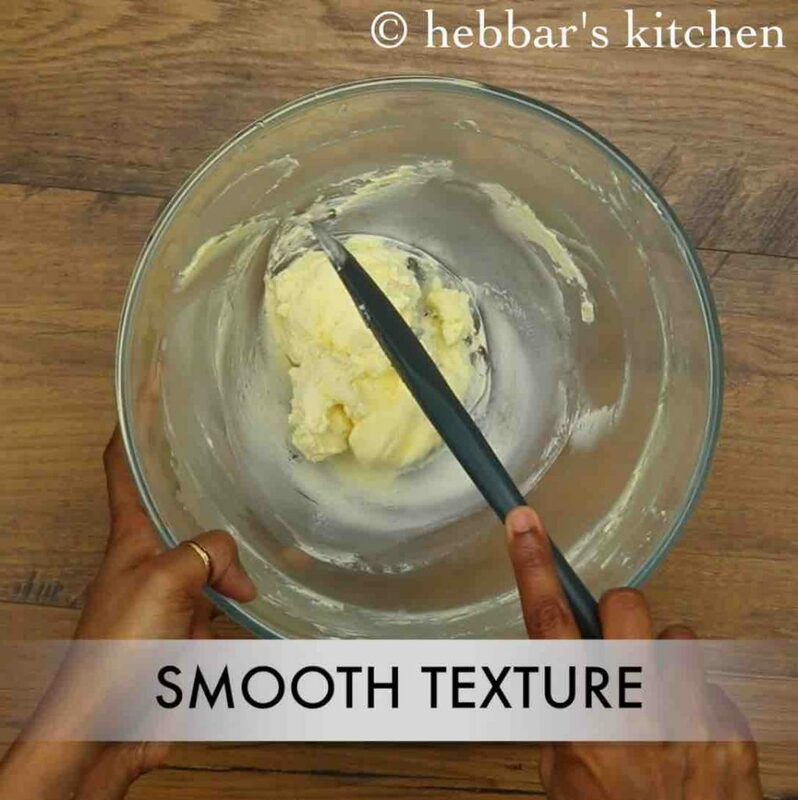 basically, this step ensures to incorporate air bubbles with the batter and helps to attain porous texture. lastly, the ghewar sweet can be served with myriad options. it can be served plain with basic sugar syrup, or perhaps with mawa, rabri, malai, dry fruits, kevra and also silver vark. 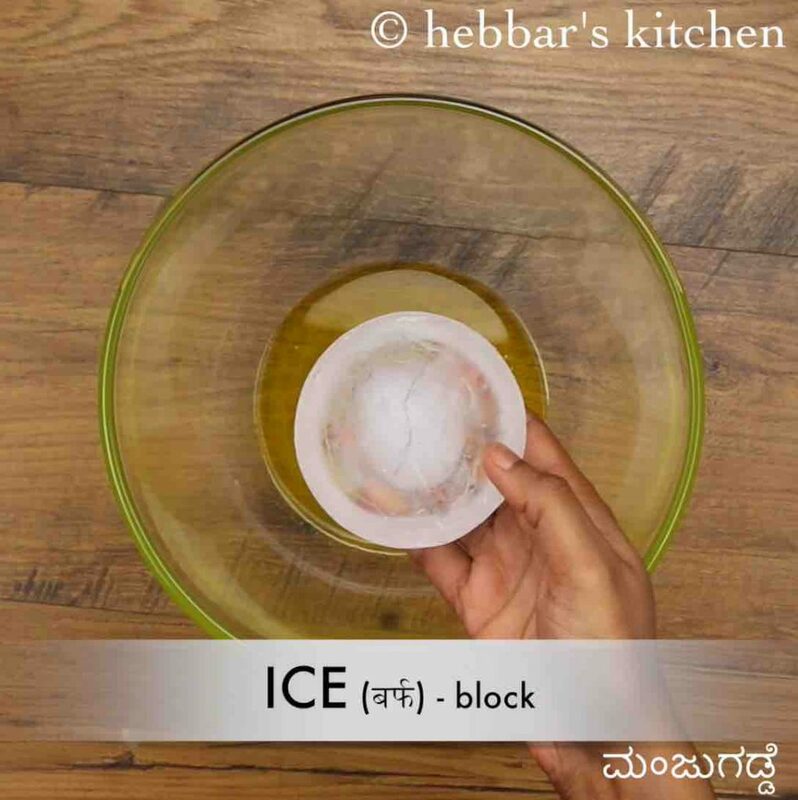 firstly, take ½ cup ghee and rub with ice block. now add 2 cup maida and crumble well. further, add ½ cup chilled milk and give a rough mix. pour the 2 tbsp of batter keeping a good distance from hot oil. pull the ghevar out once cooked, and drain off the oil completely. 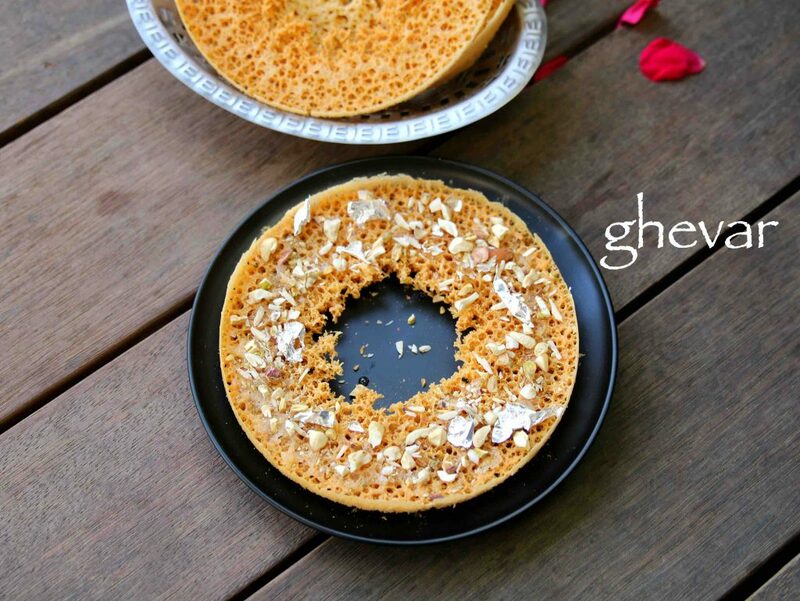 pour the sugar syrup over ghevar, garnish with chopped nuts and sprinkle cardamom powder. finally, garnish the ghevar with silver vrak or rabri and ready to serve. 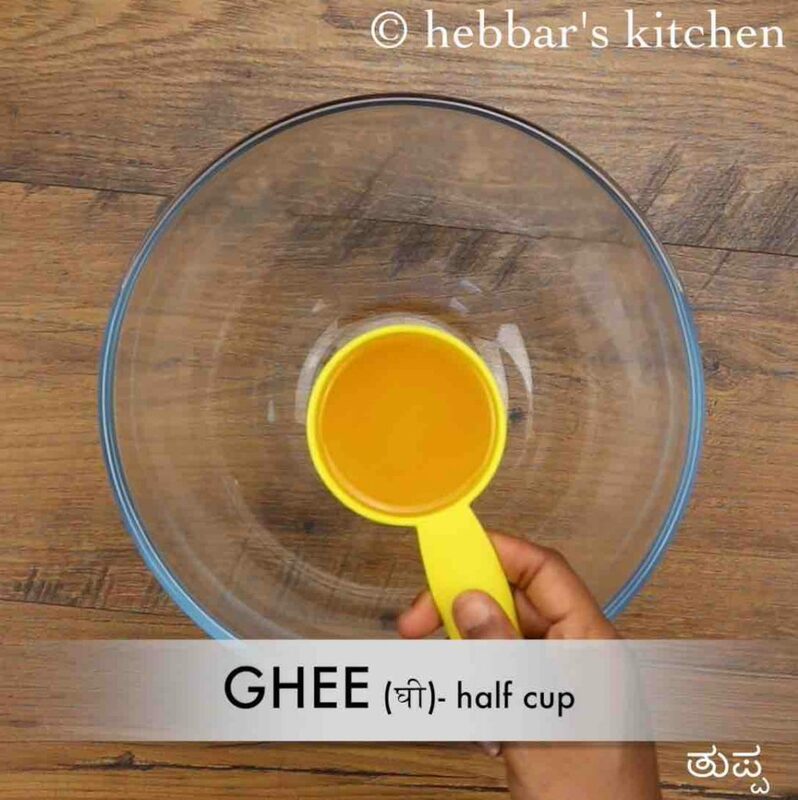 firstly, in a large mixing bowl take ½ cup ghee. also, take a large block of ice and start to rub. rub the ghee in a circular motion till the ghee thickens and turns creamy. keep rubbing for 5-6 minutes or till the ghee turns whitish. 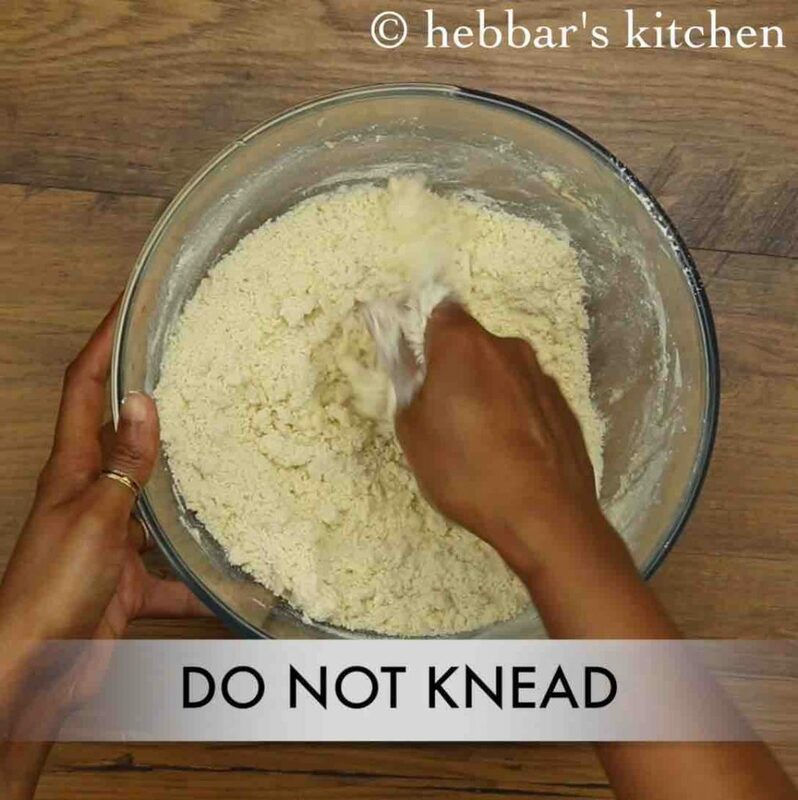 do not knead the dough as we are going to make the batter. 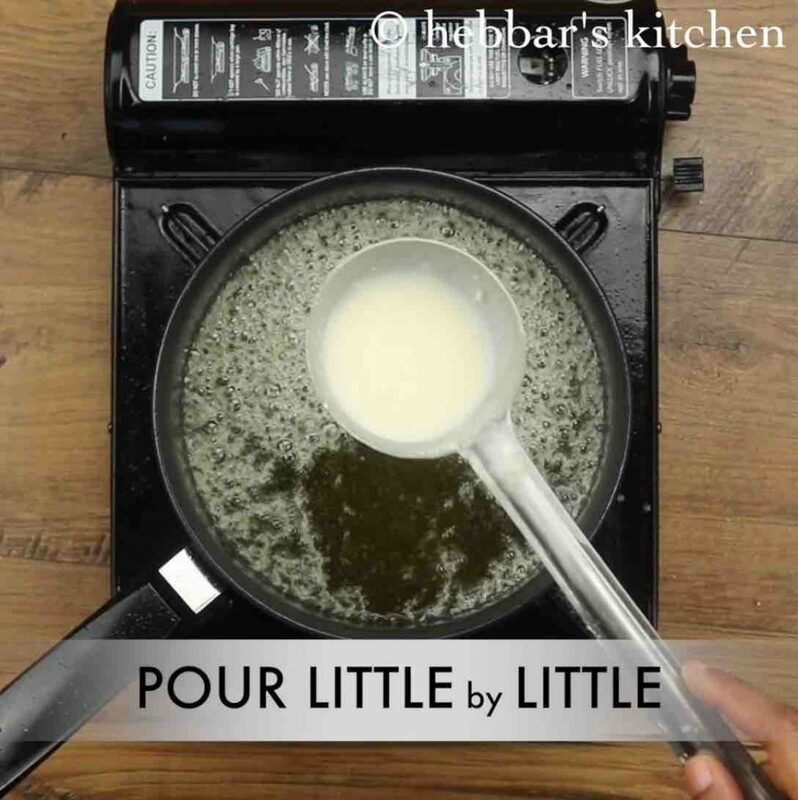 additionally, add 1 cup of chilled water and make a thick batter. 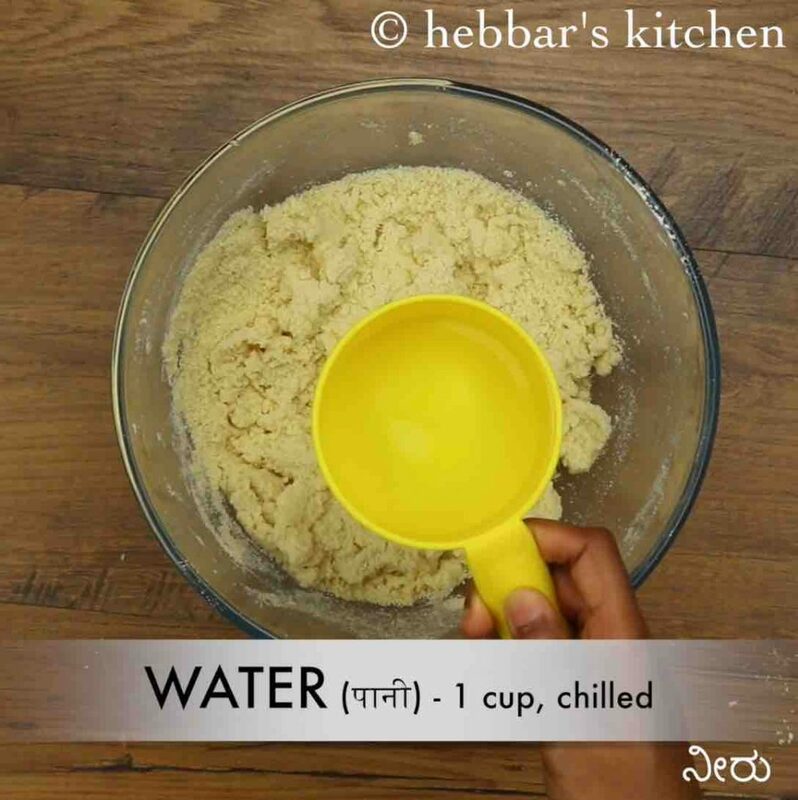 add another cup of chilled water and start to whisk for 5 minutes. furthermore, add 1 tsp lemon juice and another cup of chilled water. 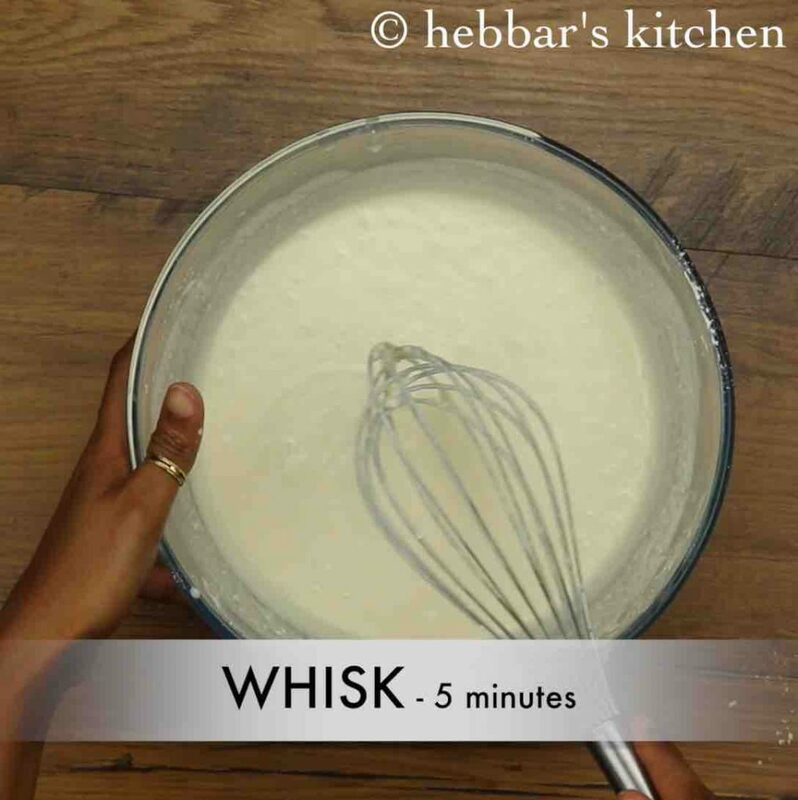 continue to whisk till there are no lumps. 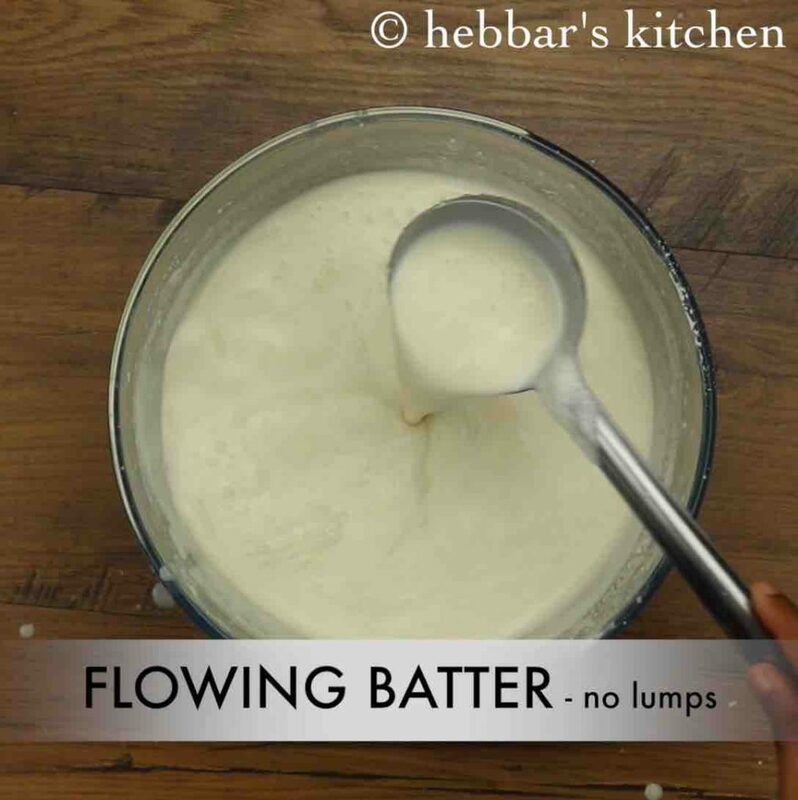 prepare a smooth flowing consistency ghevar batter. 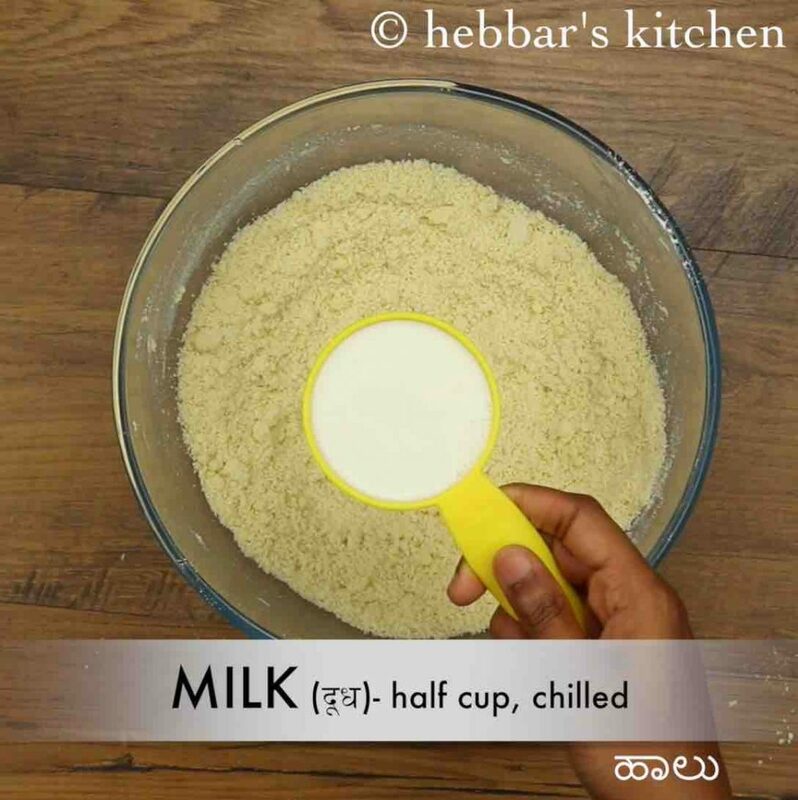 the batter is ready to make ghevar, keep chilled till you are ready to fry. 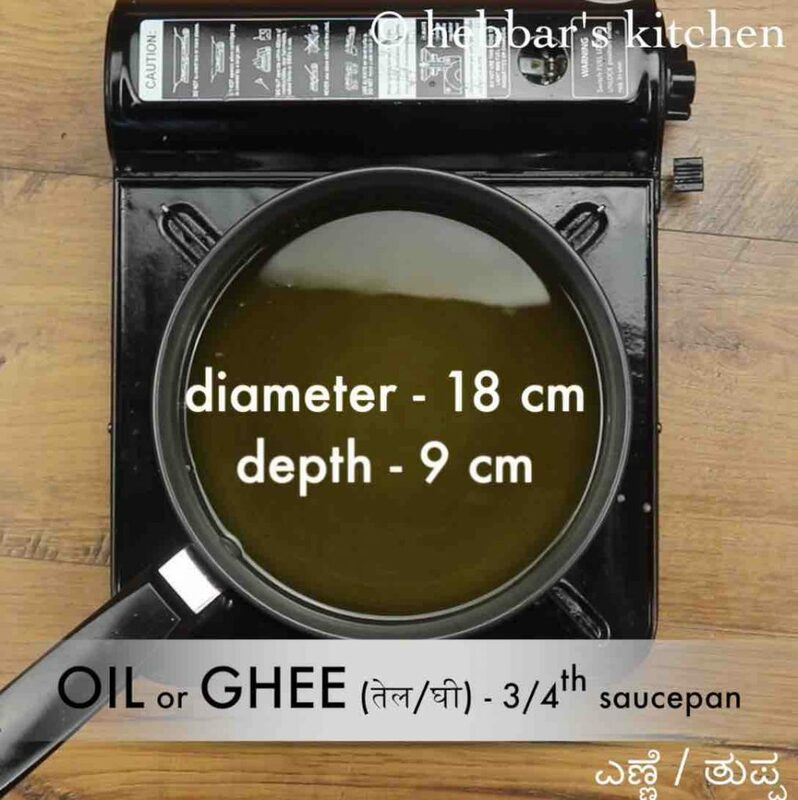 heat ¾ level of ghee or oil in a saucepan (dia – 18 cm, depth – 9 cm) or large kadai placing a ring in the centre. 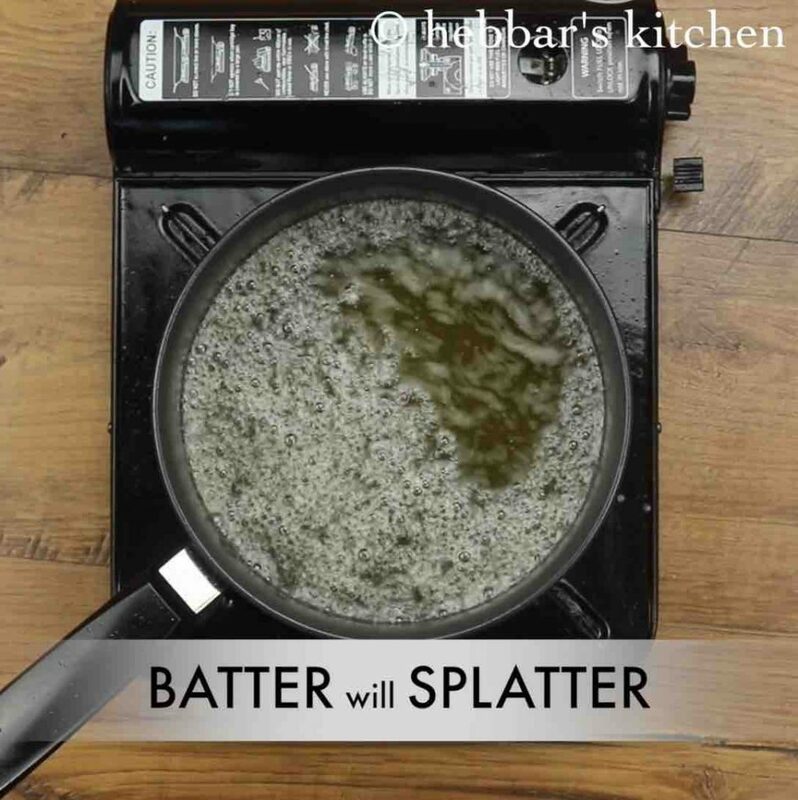 make sure the oil is very hot, then pour the 2 tbsp of batter keeping a good distance from oil (approx 10 cm). the batter will splatter and later the froth subsides. pour another 2 tbsp of better in the centre in a thin stream keeping distance from oil. 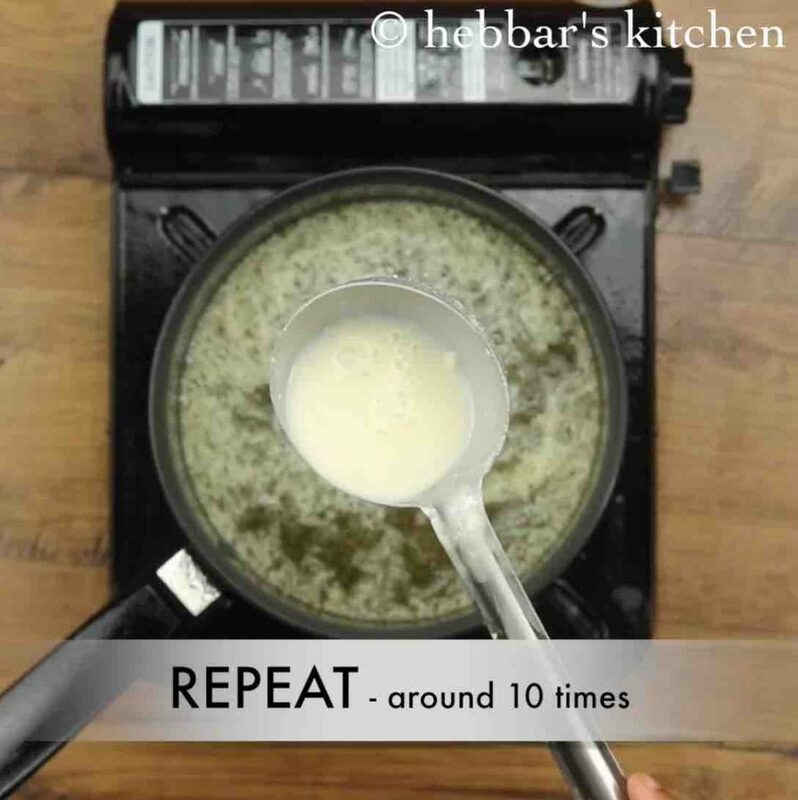 repeat 10-15 times depending on the size of the saucepan. make sure to leave a hole in the centre. fry on medium flame till the ghevar turns golden brown. 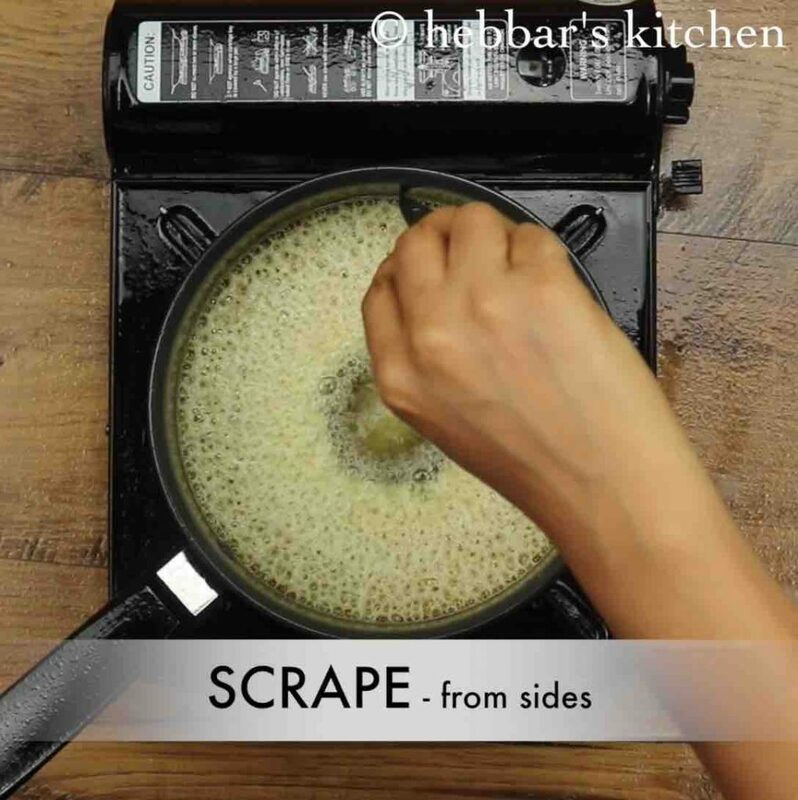 scrape the sides with a knife and push ghevar into the oil. continue to fry till the bubbles disappear completely. 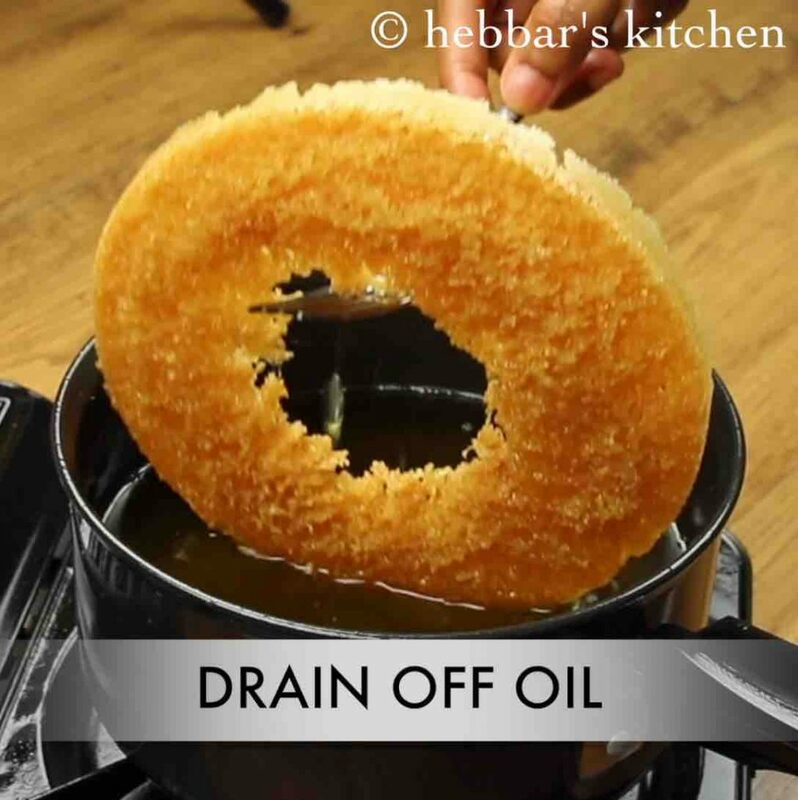 pull the ghevar out gently, and drain off the oil completely. keep aside. 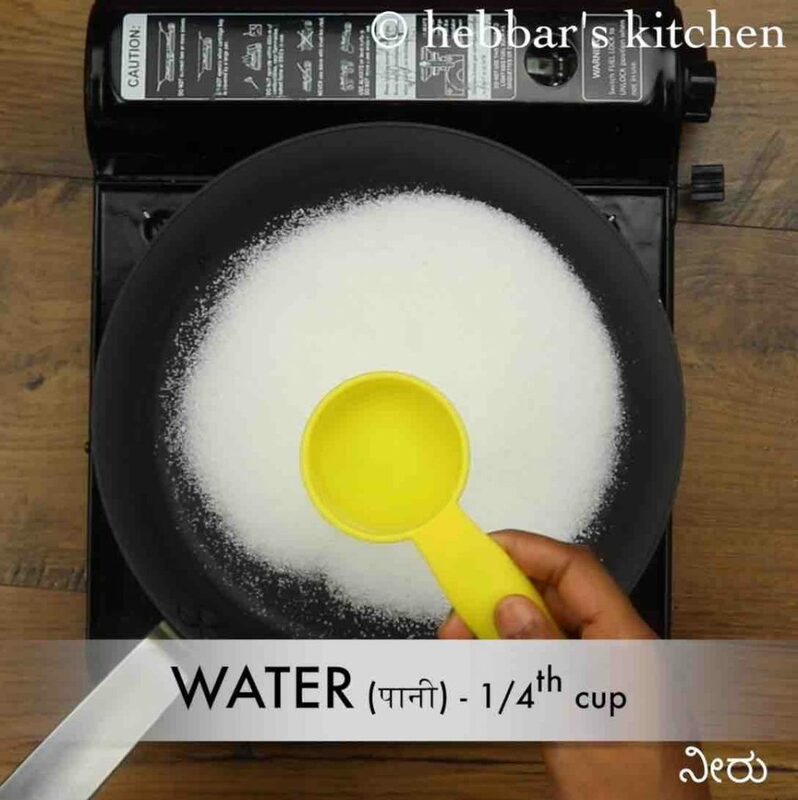 now prepare the sugar syrup by taking 1 cup sugar and ¼ cup water. 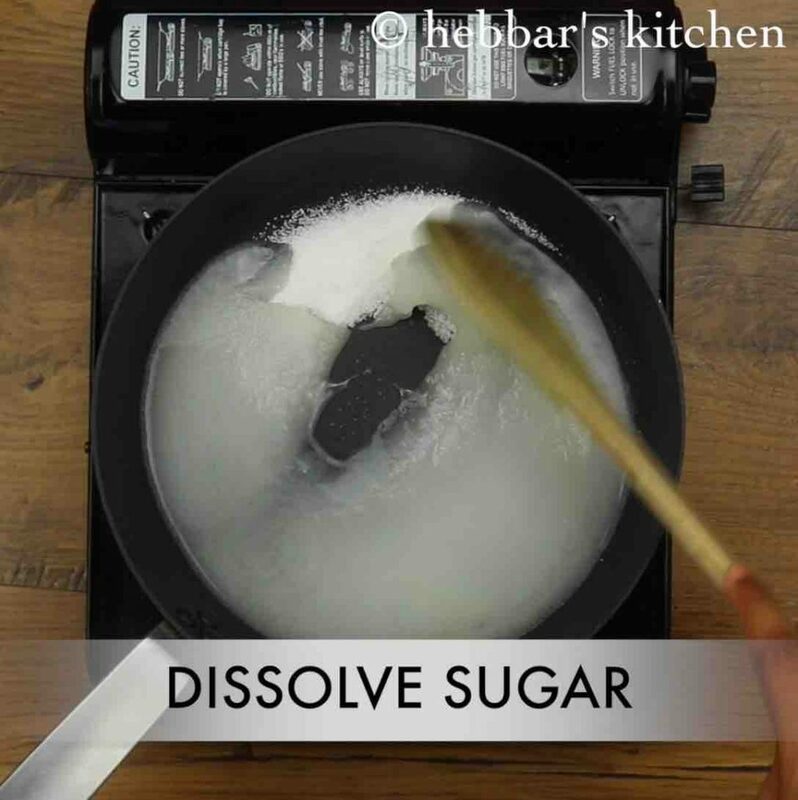 dissolve the sugar completely and boil for 5 minutes. continue to boil till 2 string consistency is attained. 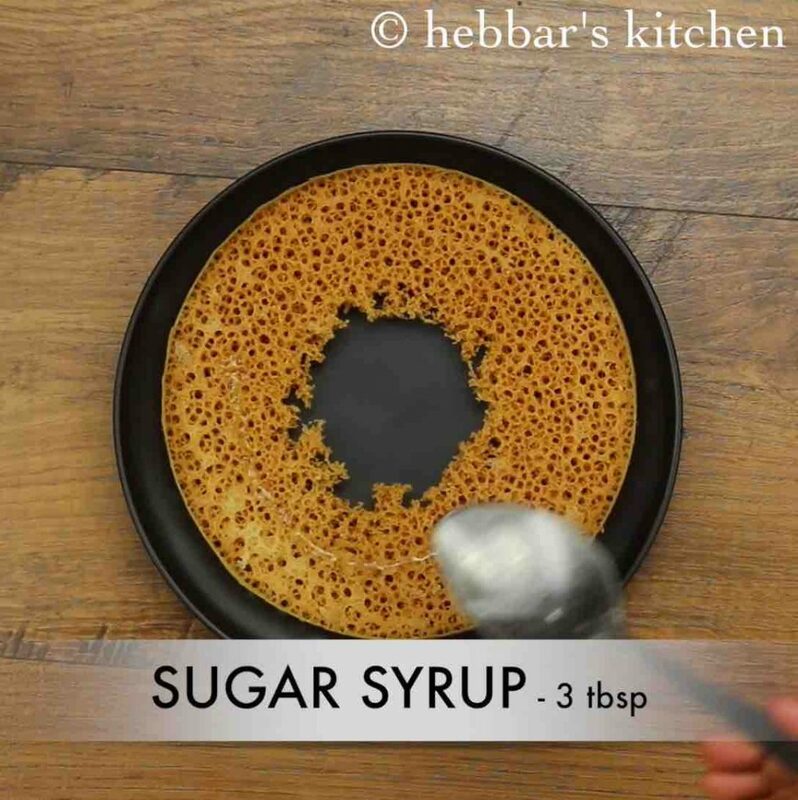 pour the sugar syrup over ghevar or dip the ghevar in sugar syrup. also, garnish with chopped nuts and sprinkle cardamom powder. firstly, keep the batter really chilled to get honeycomb texture. 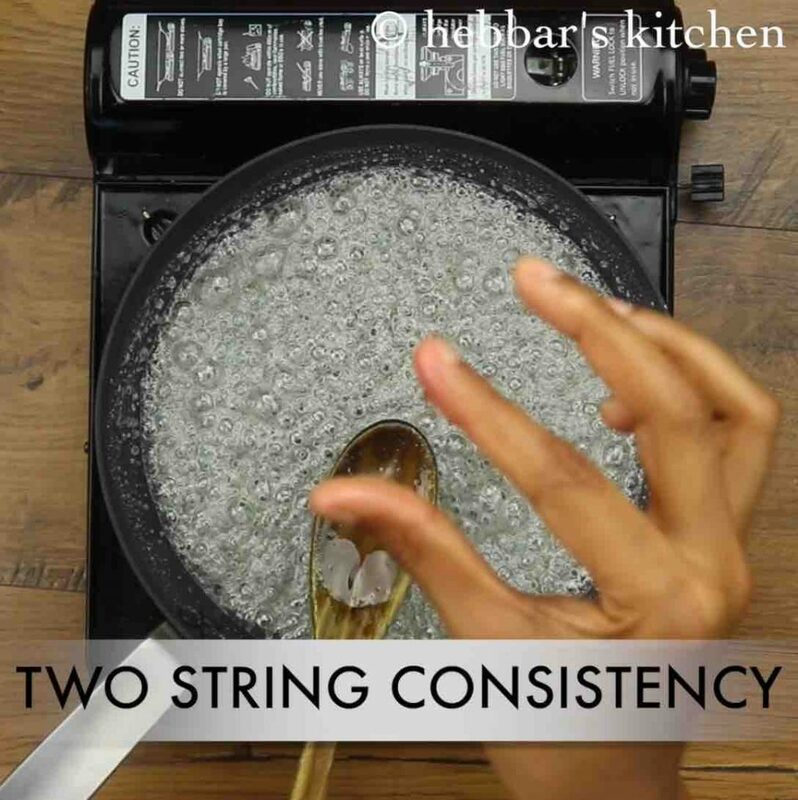 also, adjust the consistency of batter by adding ice cold water. additionally, whisk well without allowing ghee or milk from curdling. 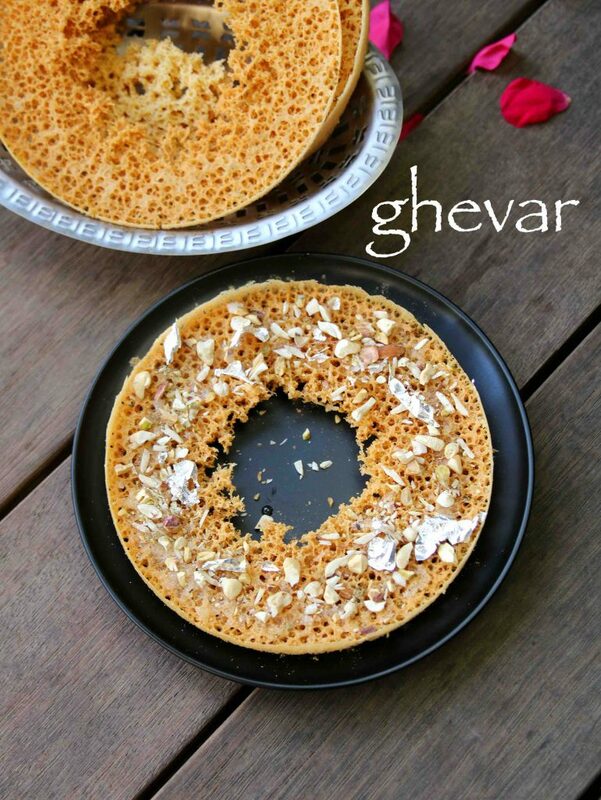 finally, ghevar can be stored for a month in an airtight container and dip in sugar syrup just before serving.